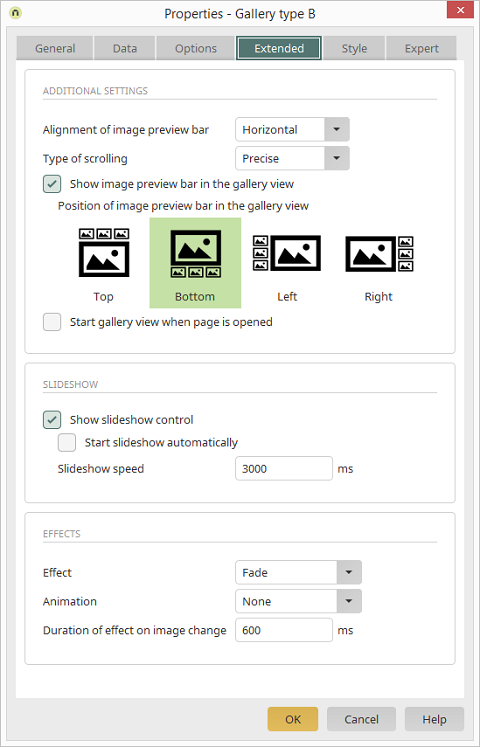 With the gallery – type B, you can set the alignment of image preview bar to be horizontal or vertical. If the mouse is moved away from the middle of the image preview bar, the image preview bar will move in the opposite direction. If the mouse is moved away from the middle of the image preview bar, the image preview bar will move in the opposite direction. In so doing, the image flow will move more quickly, the further away the mouse is moved from the middle. With this scroll type, to the right and left of the image preview bar, buttons will be shown as soon as additional images exist that cannot be viewed from the image preview bar. With this setting the image preview bar will be shown in the gallery. Effects the start of the slideshow when the page is loaded. Additional effects are available to you here that affect the images' movement when they change.